The iPad allows you to keep on top of your finances, even on the go. A variety of apps can help you manage your money and monitor your income, expenses, and investments. 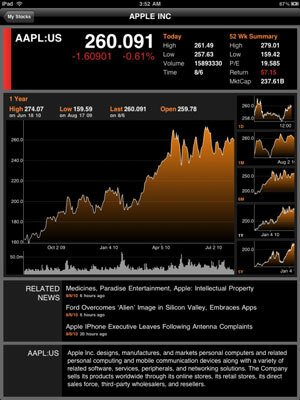 There are great apps and there’s great content, and Bloomberg for iPad is one of those terrific combinations that is both. If you want to follow finances on your iPad, you want to download this app. With this app, you get financial news, stock quotes, major indices from around the world, currency information, bond prices, the capability to track your stock portfolio, and access to a lot of market-related podcasts. 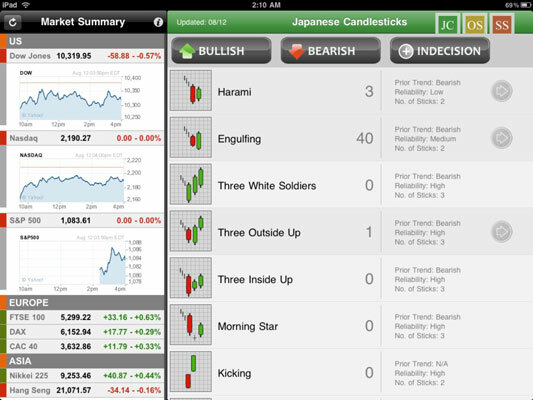 Daily Stocks is the kind of app that exemplifies the sort of specialized software that not only makes sense on the iPad, but is in part made possible by the iPad. Unlike the plethora of stock-portfolio-tracking or financial-news-information apps, Daily Stocks provides the user with technical scans of the market. In other words, it’s designed to highlight trends in the marketplace, using some highly technical analytical techniques (most of which are for fairly serious traders) so that users can identify opportunities and risks. These are all very technical kinds of reports and scans; if you’re not an active trader, you probably don’t need this app. If you are, however, you’re likely to find it very useful. 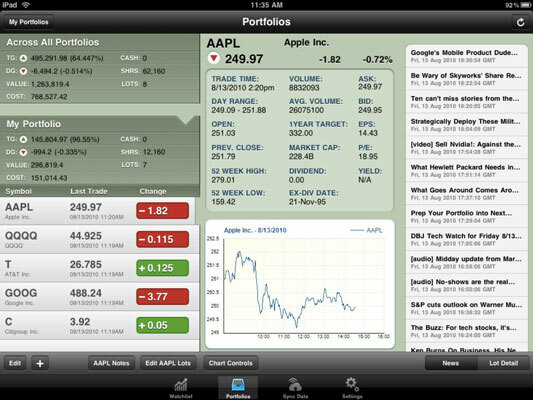 With this app, you can buy and sell stocks and options, transfer money around on your E*TRADE accounts, set up or manage watch lists, monitor your orders, manage and receive alerts, monitor your portfolio, get stock quotes, and get news, all from within this very well-designed and elegant iPad app — and the company has done an excellent job of putting all that screen real estate to use. Most of this app’s features require an E*TRADE account. You can’t buy or sell stocks, for instance, without such an account, and you can’t have a portfolio of stocks or get alerts, and so on. What you can do, however, is get stock quotes and company news articles and see the stock indexes — even without an account. 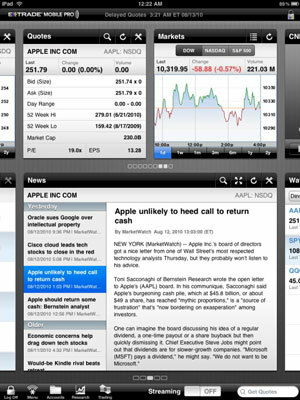 StockSpy HD allows you to see exactly how the news affected a stock’s price in stark visual terms. You don’t normally see a strong correlation between news and a stock’s performance, but for some companies, or for an active (or even volatile) stock, the news surrounding that company has a frequent and direct impact on how its stock performs. Stockwatch is laid out well and it offers some great features. For example, you can have a Watchlist for stocks you’re watching that’s separate from your portfolio. Better yet, you can have an unlimited number of portfolios — and each portfolio allows you to add an unlimited number of stocks and other symbols. Stockwatch then allows you to track the value of your combined portfolios or drill down to see how individual portfolios or stocks are doing. Stockwatch offers a wide array of preferences you can use to tweak your views and the format of your data. Most users will appreciate the defaults for all these preferences, but if you want things just so, Stockwatch is very tweakable. SplashMoney HD is a money management app for the iPad that allows you to monitor online banking accounts and credit cards, create budgets, and track your actual spending (within those budgets, right?). You can synch data between the iPad app and the Mac or Windows version of the software, too, which is very handy. It also includes an app-specific password option for additional security. Marketboard is a visually appealing app that offers some nice features. For one thing, it offers a live scrolling look at all the major indices, and you can add stocks to a Watchlist for snapshot looks. In addition, Marketboard offers access to the company’s extensive financial news coverage, and that alone will be worth the download for many users. The app also highlights recent earnings calls across the market and allows you to purchase and view transcripts from those calls right there in the app. Transcripts won’t appeal to everyone, but if you like to do that sort of research, you’ll want Marketboard in your arsenal. As the name suggests, XpenseTracker allows you to track your expenses, both business and personal. It has some nice features — such as remembering your last payment transaction for each of the categories — and it supports all major currencies. XpenseTracker is one of the few expense-tracking apps that supports Dropbox, which makes it is easy to import and export files from your computer — which can be the key to actually using an app like this effectively.